Mitchell B. Berger, M.D., adjunct clinical associate professor of obstetrics and gynecology; and Megan O’Brien Schimpf, M.D., associate professor of obstetrics and gynecology, published “Completion of a validated pelvic floor symptom and bother instrument in real-life practice” in the International Urogynecology Journal, June 2018. Jennifer Bragg-Gresham, Ph.D., assistant research scientist of internal medicine, co-wrote “County-level Air Quality and the Prevalence of Diagnosed Chronic Kidney Disease in the U.S. Medicare Population” for PLOS ONE in 2018. Hal Morgenstern, Ph.D., professor emeritus of urology; and Rajiv Saran, M.B.B.S., M.D., the Florence E. Bingham Research Professor of Nephrology and professor of internal health, contributed. Saran and Morgenstern also contributed to “Race/Ethnicity, Dietary Acid Load and Risk of ESRD among U.S. Adults with CKD,” published in vol. 47, no. 3 of the American Journal of Nephrology; and “Projecting ESRD Incidence and Prevalence in the United States through 2030” in the January 2019, vol. 30, issue 1, of the Journal of the American Society of Nephrology. William H. Herman, M.D., MPH, the Stefan S Fajans M.D./GlaxoSmithKline Professor of Diabetes and professor of internal medicine, also contributed. Michelle S. Caird (M.D. 1998, Residency 2003), the Larry S. Matthews, M.D., Collegiate Professor of Orthopaedic Surgery; and Kenneth M. Kozloff (Ph.D. 2005), associate professor of orthopaedic surgery and of biomedical engineering, co-authored “Low Dose of Bisphosphonate Enhances Sclerostin Antibody-induced Trabecular Bone Mass Gains in Brtl/+ Osteogenesis Imperfecta Mouse Model,” published in the May 2018 issue of the Journal of Bone and Mineral Research. Vanessa Dalton, M.D., MPH, professor of obstetrics and gynecology, contributed to “Decision Satisfaction Among Women Choosing a Method of Pregnancy Termination in the Setting of Fetal Anomalies and Other Pregnancy Complications: A Qualitative Study,” published in vol. 101, issue 10 of Patient Education and Counseling. John O. DeLancey, the Norman F. Miller Professor of Gynecology, professor of obstetrics and gynecology, and of urology; Anne Pelletier Cameron, M.D., associate professor of urology; and J. Quentin Clemens, M.D., the Edward J. McGuire Professor of Urology, chief of the Division of Neurourology and Pelvic Reconstruction, and director of the Female Pelvic Medicine and Reconstructive Surgery Fellowship, contributed to “Symptom Based Clustering of Women in the LURN Observational Cohort Study,” published in the July 2018 issue of the Journal of Urology. DeLancey, along with James Ashton-Miller, Ph.D., the Albert Schultz Collegiate Research Professor and Distinguished Research Professor of Biomedical Engineering, and research professor of internal medicine, also co-wrote “Technique Development and Measurement of Cross-Sectional Area of the Pubovisceral Muscle on MRI Scans of Living Women,” published in the International Urogynecology Journal. Mohammad Ghaziuddin, M.D., professor of psychiatry, published Medical Aspects of Autism and Asperger Syndrome: A Guide for Parents and Professionals, Jessica Kingsley Publishers, 2018. Gary D. Hammer, M.D., Ph.D., the Millie Schembechler Professor of Adrenal Cancer, professor of internal medicine, of molecular and integrative physiology, and of cell and developmental biology, edited Pathophysiology of Disease: An Introduction to Clinical Medicine, eighth edition, McGraw-Hill, 2018. 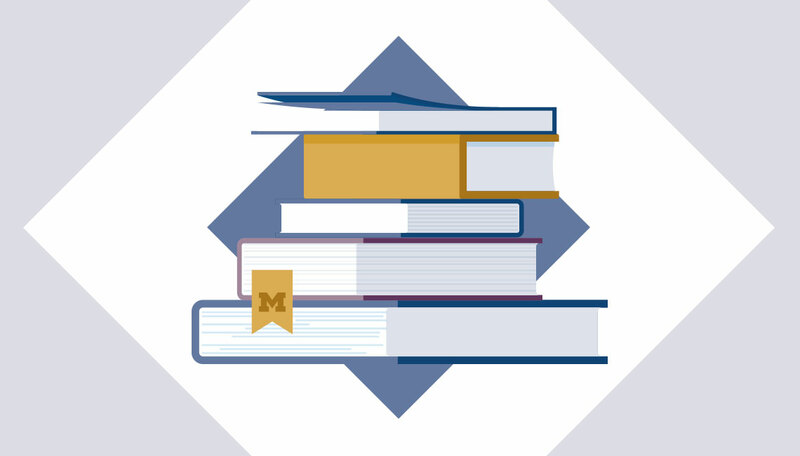 Thirteen U-M faculty members also contributed. Cornelius Jamison, M.D., clinical lecturer of family medicine; Tammy Chang, M.D., MPH, assistant professor of family medicine; and Okeoma Mmeje, M.D., assistant professor of obstetrics and gynecology, published “Expedited Partner Therapy: Combating Record High Sexually Transmitted Infection Rates,” in the American Journal of Public Health, October 2018. Shruti Jolly, M.D., associate professor of radiation oncology, associate chair of community practices, and chief of brachytherapy services; Christina Hunter Chapman, M.D., assistant professor of radiation oncology; Pamela Fairchild, assistant professor of obstetrics and gynecology; Mitchell B. Berger, M.D., adjunct clinical associate professor of obstetrics and gynecology; Daniela Wittman, Ph.D., associate professor of urology; Shitansu Uppal, M.B.B.S., associate professor of obstetrics and gynecology; Katherine Maturen, M.D., associate professor of radiology and director of the Abdominal Radiology Fellowship Program; contributed to “Gynecologic radiation oncology patients report unmet needs regarding sexual health communication with providers,” published in the Journal of Cancer Research and Clinical Oncology, December 2018. Vivek Kalia, M.D., MPH, assistant professor of radiology, co-authored “Imaging in Patellofemoral Pain” in Patellofemoral Pain and Instability: Etiology, Diagnosis and Management, Springer International Publishers, 2019. He also authored “Imaging in Patellofemoral Instability” in Patellofemoral Pain and Instability: Etiology, Diagnosis and Management, Springer International Publishers; co-authored “Airways Disease & Emphysema” in Brant and Helms’ Fundamentals of Diagnostic Radiology, Wolters Kluwer, 2019; co-authored “Current Concepts Review: Quantitative Evaluation of Hip Impingement Utilizing Computed Tomography Measurements” in the Journal of Bone & Joint Surgery, vol. 100, issue 17; co-authored “Postoperative Rotator Cuff: Multimodality Imaging Review” in the American Journal of Roentgenology, vol. 211, issue 3, with Jon. A Jacobson, professor of radiology in the Division of Musculoskeletal Radiology; Michael T. Freehill, associate professor of orthopaedic surgery; and Bruce S. Miller, associate professor of orthopaedic surgery; co-authored “Musculoskeletal Ultrasound: Athletic Injuries of the Lower Extremity” in Ultrasonography, vol. 37, issue 3, with co-authors Nathaniel B. Meyer, clinical lecturer of radiology in the Division of Musculoskeletal Radiology; Sung Moon Kim, professor of radiology in the Division of Musculoskeletal Radiology; and Jon. A Jacobson, professor of radiology in the Division of Musculoskeletal Radiology; co-authored “Brachial Plexitis or Neuritis? MRI Characteristics of Parsonage-Turner Syndrome” in Muscle & Nerve, vol. 58, issue 3; co-authored “The APDR Academic Output Task Force: Assisting Today’s Busy Radiology Educators” in the Journal of the American College of Radiology, vol. 15, issue 7; co-authored “Best practices from the APDR: improving medical student exposure to interventional radiology” in Academic Radiology, vol. 25, issue 6; co-authored “Leveraging Twitter to Maximize the Radiology Meeting Experience” in the Journal of the American College of Radiology, vol. 15, issue 1 part B; and co-authored “Osteochondral Allograft Transplantation to Treat Focal Chondral Lesions in the Knee in Patients Aged 40 Years and Older” in the American Journal of Sports Medicine, vol. 46, issue 3. Daniel Morgan, M.D., professor of obstetrics and gynecology and of urology, contributed to “Length of Catheter Use After Hysterectomy as a Risk Factor for Urinary Tract Infection,” published in Female Pelvic Medicine and Reconstructive Surgery, vol. 24, issue 6. Jonathan Morrow, M.D., Ph.D., assistant professor of psychiatry, published Sign-Tracking and Drug Addiction, Maize Books, 2018. Maria Muzik, M.D., associate professor of psychiatry and of obstetrics and gynecology, and co-director of the Women and Infants Mental Health Program; and Kate Rosenblum, Ph.D., professor of psychiatry and of obstetrics and gynecology, and co-director of the Women and Infants Mental Health Program and Zero to Thrive, published Motherhood in the Face of Trauma: Pathways Towards Healing and Growth, Springer, 2018. It can be downloaded through U-M for free here. Michelle Riba, M.D., associate director of the U-M Depression Center, clinical professor and program director of the Psychosomatic Medicine Fellowship, and director of the PsychOncology Program at the U-M Rogel Cancer Center; and Kirk Brower, M.D., professor of psychiatry, edited Physician Mental Health and Well Being, Spring, 2017. Riba also published Person Centered Approach to Recovery in Medicine, Springer, 2019. Kayte Spector-Bagdady, J.D., MBioethics, assistant professor of obstetrics and gynecology and chief of the Research Ethics Service in the Center for Bioethics and Social Sciences in Medicine (CBSSM); and Reshma Jagsi, M.D., D.Phil, professor of radiation oncology, deputy chair and residency program director of radiation oncology, and director of the CBSSM, published “Big Data, Ethics, and Regulations: Implications for Consent in the Learning Health System,” in the International Journal of Medical Physics Research and Practice, August 2018. Spector-Bagdady, with Raymond De Vries, Ph.D., co-director of CBSSM and professor of learning health sciences and of obstetrics and gynecology; Michele Gornick, Ph.D., research investigator of internal medicine; Andrew G. Shuman, M.D., assistant professor of otolaryngology-head and neck surgery, and co-chief of the Clinical Ethics Service of CBSSM; and Jodyn Platt, MPH, Ph.D., assistant professor of learning health sciences, published “Encouraging Participation And Transparency In Biobank Research,” in vol. 37, no. 8 of Health Affairs. Maria Thomas, director of Community Benefit and Community Health Needs Assessment and child advocacy director at U-M, wrote “Voting Will Not End White Supremacy,” published on Medium.com. Sara Till, M.D., MPH, clinical lecturer of obstetrics and gynecology; Sawsan As-Sanie, M.D., MPH, associate professor of obstetrics and gynecology; and Andrew Schrepf, Ph.D., research investigator of anesthesiology, published “Psycology of Chronic Pelvic Pain” in vol. 62, no. 1 of Clinical Obstetrics and Gynecology. “Sexual Harassment: When the Patient is the Perpetrator” was published in volume 392, issue 10145 of The Lancet. Authors include Elizabeth M. Viglianti, M.D., MPH, clinical lecturer and research fellow in the Department of Internal Medicine, Division of Pulmonary and Critical Care; Andrea L. Oliverio, M.D., clinical lecturer in the Department of Internal Medicine, Division of Nephrology; and Lisa M. Meeks, Ph.D, assistant professor in the Department of Family Medicine. Meeks also co-authored “Accessibility, Inclusion, and Action in Medical Education: Lived Experiences of Learners and Physicians With Disabilities,” a special report from the Association of American Medical Colleges. Off He Goes! Growing Up with Brachial Plexus Palsy, written by Susan B. Tomford, was published in 2018 by Michigan Publishing. Lynda Yang, M.D., Ph.D., professor of neurosurgery and director of the Brachial Plexus and Peripheral Nerve Program, and her mother, You-Chyung Lin, illustrated the book; and Susan Brown, Ph.D., Arthur F. Thurnau Professor and associate professor of kinesiology, contributed.